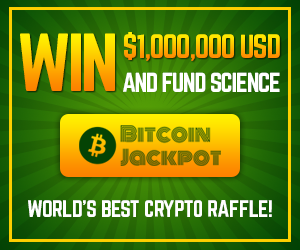 Prize: Enter for a chance to win up to $1,000,000 in crypto currency! SHORT RULES: Open worldwide to those of the AOM in the country of residence. Unlimited entries via purchased tickets. One entry per person via No Purchase Entry Option. What you must do to enter: Send in your No Purchase Entry request via email: service@bitcoinjackpot.global with “My Free Entry Request” in the subject line and your real first name and valid email. Statistics: This contest was opened by 129 and entered by 8 ContestChest.com members. 6% of those who opened the contest, entered it.